1940s – Sanford High meets with state highway officials to promote the welding of steel bridges rather than riveting, which had been the universally accepted practice at the time. 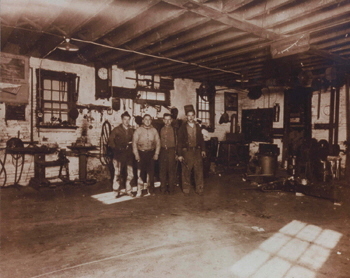 Pictured: An early photograph of High Welding Company. 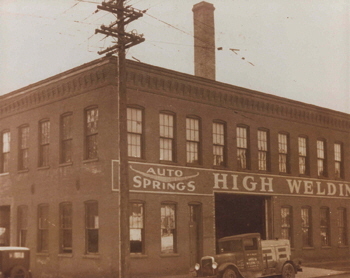 1941 - High Welding Company moves to a new facility and expands its fabrication capacity. 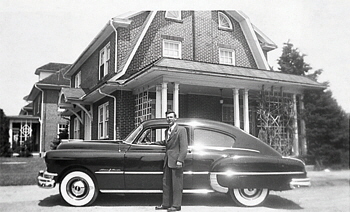 1951 – Sanford High’s son, Calvin G. High joins the company. Calvin retired from High Industries, Inc. in 1997 and he retired from the Board of Directors of High General Corporation (which is affiliated with High Real Estate Group LLC) in 2010. Pictured: Calvin G. High. 1953 - The company receives its first sizable steel fabrication contracts. Pictured: Sanford H. High. 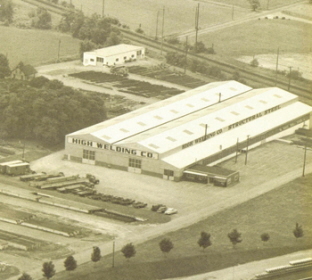 1955 – High Welding Company continues to grow and moves to a new facility. 1963 – S. Dale High, the youngest son of Sanford High, joins the company full time after graduating from Elizabethtown College and having worked in the steel plant. 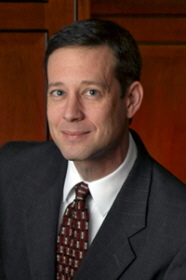 Currently, Dale serves as Board Chair of High Industries Inc. and High Real Estate Group LLC. Pictured: S. Dale High. 1963 – Marking the beginning of expansion into other businesses, High Realty Company is formed, the forerunner of High Real Estate Group LLC. The first build-lease building is constructed in what would become Greenfield Corporate Center, a 600-acre master planned business campus. 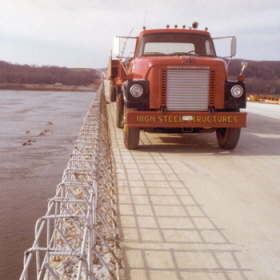 Pictured: Greenfield Corporate Center, Lancaster, Pa.
1970 – High Welding Company receives a contract for a bridge spanning Pennsylvania’s Susquehanna River. 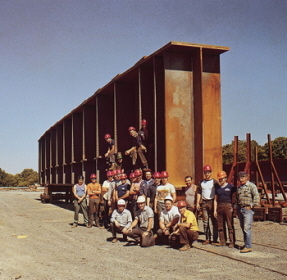 In 1971, the company changes its name to High Steel Structures LLC to more accurately reflect what it had become — a leader in structural steel engineering, fabrication and erection. 1977 - Kurtz Precast Corporation is acquired, the forerunner of High Concrete Group LLC. 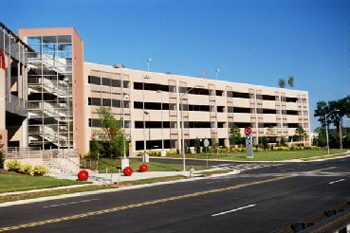 Pictured: Target Corporation parking facility, Rockville, Md. High Concrete Group LLC supplied precast concrete components for this project. 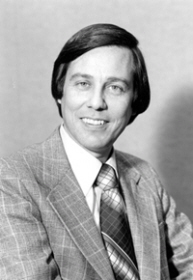 1977 – Richard L. High, Calvin High’s son, joins High Steel Structures LLC as master scheduler/project manager. Currently, Rick serves as estimator/manager of contracts at High Associates Ltd.’s Construction Services Group. 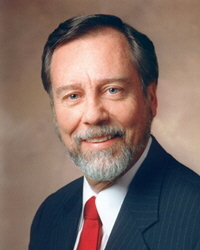 Rick retired from the Board of Directors of High General Corporation in 2010. 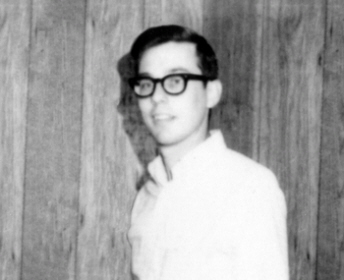 Pictured: Richard L. High. 1978 – High Steel Service Center LLC opens, providing a full range of carbon and alloy steel products; and, Lantz Builders, Inc., the forerunner of High Construction Company, is acquired. 1980 – High Associates Ltd. is formed to sell, lease, and manage commercial, industrial, and residential real estate. 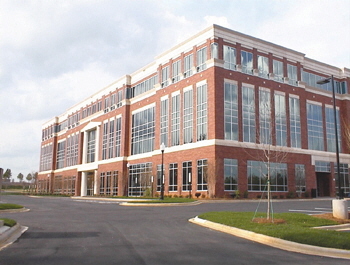 Pictured: Mallard One, a Class-A office building in Charlotte, N.C.; is developed, owned, and managed by affiliates of High Real Estate Group LLC. 1980 – The High Foundation, a philanthropic, non-profit organization, is formed. 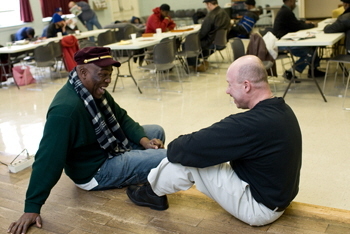 Its mission is to make a significant difference in the lives of those most in need in our community. The High Family continues its commitment to philanthropy and in 2010, The S. Dale High Family Foundation and The Calvin and Janet High Family Foundation were established to succeed The High Foundation. These two foundations are positioned to address a broader range of philanthropic interest in the community. Pictured: Water Street Community Homeless Outreach Center. 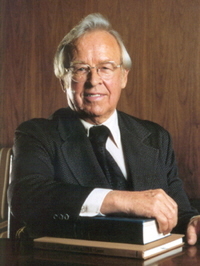 1983 - Sanford H. High, the company’s founder, passed away. Through his vision, hard work, and perseverance, he started what has now become the High companies. He is remembered fondly by his family and those who knew him. Pictured: Sanford H. High. 1985 – Williamsport Fabricators Inc. is acquired by High Steel Structures LLC. This acquisition increases market share and expands service to customers. 1988 – High Hotels Ltd. is formed to develop and manage limited-service hotels. 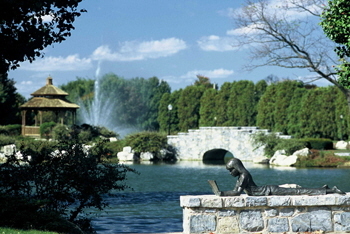 In 1989, the Hampton Inn Lancaster opens. 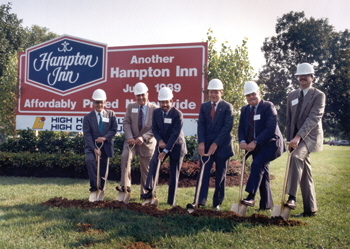 Pictured: Groundbreaking for the Hampton Inn Lancaster. 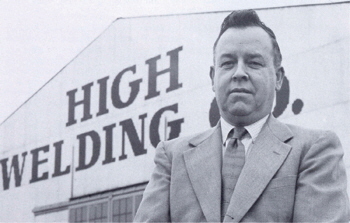 1989 – Steven D. High, S. Dale High’s son, joins High Industries Inc. as a safety specialist. Subsequently, High Safety Consulting Services Ltd. is founded by Steve who continues to serve as its president and as a director on the Boards of the High Industries Inc. and High Real Estate Group LLC. Pictured: Steven D. High. 1990 – Greenfield Architects Ltd. is formed to provide architecture, adaptive reuse, interior design and planning services to the construction industry. 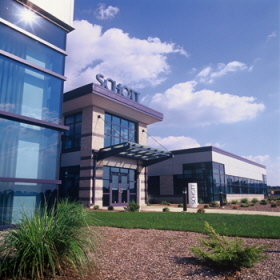 Pictured: Schott Pharmaceutical’s office/distribution facility, Lebanon, Pa., designed by Greenfield Architects Ltd. High Construction Company served as the construction manager. 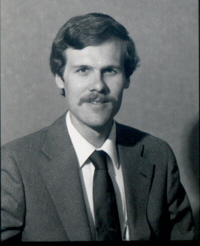 1991 – Gregory A. 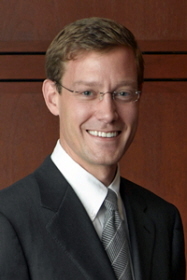 High, S. Dale High’s son, joins High Associates Ltd. as marketing representative. Currently, Greg serves as a director on the Boards of High Industries Inc. and High Real Estate Group LLC and leads ownership-level strategic planning. Pictured: Gregory A. High. 1993 – The S. Dale High Family assumes full ownership of High Industries Inc. and its affiliated operating companies High Steel Structures LLC, High Concrete Group LLC, High Steel Service Center LLC, High Associates Ltd., High Construction Company, and High Hotels Ltd. Pictured: The Arthur Ravenal Jr. Bridge in Charleston, S.C. High Steel Structures LLC was a primary supplier of structural steel components for this three and one-half mile long bridge — the longest cable-stay bridge in North America. 1994 – High Family Partnership is formed by the S. Dale High Family and seeks growth through development and acquisition of apartment communities, retail centers and commercial buildings. 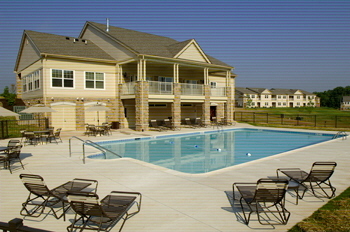 Pictured: Orchard Ridge Apartments’ clubhouse and pool area, Pottstown, Pa.
1998 – The S. Dale High Family assumes the role of general partner in High Properties, the primary asset-holding real estate company, with the Calvin G. High Family continuing as a limited partner. Pictured: Bosch Security Systems corporate office and distribution/manufacturing center in Greenfield Corporate Center is a build-to-suit-to-lease project of affiliates of High Real Estate Group LLC. 2004 – High Concrete Group LLC expands the geography it serves with the acquisition of plants in Springboro, Ohio, and Paxton. Ill. Pictured: The Condell Medical Center in Libertyville, Ill. High Concrete Group LLC provided precast concrete products for this award-winning project. 2005 – The company consolidates management of the real estate assets and operations under High Real Estate Group LLC. 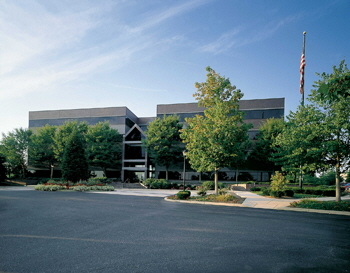 Pictured: High Real Estate Group LLC's headquarters at the High companies corporate offices, Greenfield Corporate Center, Lancaster, Pa.
2005 – Suzanne M. High Schenck, S. Dale High’s daughter, is active on The High Family Council and chairs The High Family Assembly. 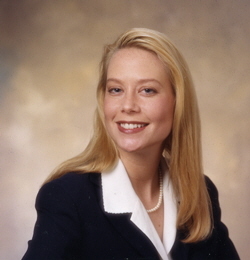 Pictured: Suzanne M. High Schenck. 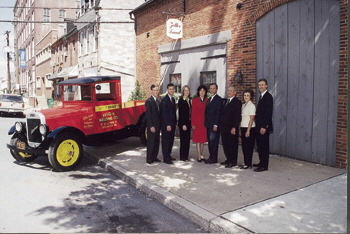 1963 – Present – Under S. Dale High’s leadership, the company grows from a single entity with annual sales of $1 million and 60 employees in Lancaster, Pa., to multiple business entities across the eastern and Midwestern United States with annual sales of more than $500 million and more than 2,200 employees. Pictured: S. Dale High. Today, as ownership transitions to the third generation, The High Family Council continues to provide leadership and ensures that the values and philosophy established by previous generations of the High Family continue to guide the High companies. 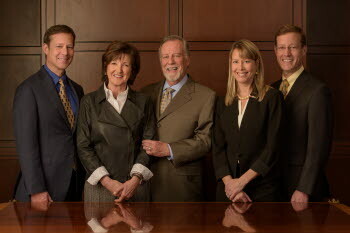 Pictured left to right are Steven D. High, Sadie H. High, S. Dale High, Suzanne M. High Schenck, and Gregory A. High.